In the year 2005, Noriyasu Hamada, the 11th generation, inherited, at age 43, the company and succeed to Masutane. His objective: to develop and continue the diversification by emphasizing the roots of the company. Most spectacular example: the company is planning to undertake a major project named "Isuzu Native Land" or "Okage Native Land" as a place to warmly welcome visitors. The idea is to create a commercial centre, situated on the banks of the clean and transparent waters of the Isuzu River for presenting to the visitors the "Real Japan," offering them a place where they can experience and enjoy a lifestyle from ancient times. Today, Akafku Co., Ltd realises a turn over of more than 66 million Euro and employs 529 persons.What a long way since the creation of a tea shop intended to restore the pilgrims of the Shrine-Ise. At the time of the Edo period (1603 - 1867), historic records indicate that the Ise Shrine, the "spirit of the Japanese people", was visited by almost one-fifth of the inhabitants of the archipelago in one year. To reach Ise from different regions, they had to travel several weeks on foot. In 1707, Jiheê Hamada established a confectionery on the banks of the Isuzu River which runs through the grounds of the Inner Shrine of Ise. He had the idea to propose to the pilgrims his Japanese rice cake name Akafuku mochi with a welcome sustainable and tasty refreshment to help them recovering from several weeks of travel. A century and a half later, the Akafuku tea house, had to recover all at the same time from the death of Tanesuke Hamada, the sixth descendant of the founder, and the great flood of the Isuzu river. In the reconstruction, Mrs Chie (Mrs Hamada) seized the opportunity to expand the establishment to its present size. This occurred in 1877. From that time, in praise of the splendid undertaking, people began calling her "The mother of the rebirth of Akafuku". In addition, in the year 1887, Mrs Chie installed a gigantic horizontal signboard, again changing the appearance of the front of the Head shop. Seventh successor, also name Tanesuke, got the idea in 1907 to place rice cakes filled with sweet bean paste into boxes and, for the first time, sell them in a stand outside of the shop. 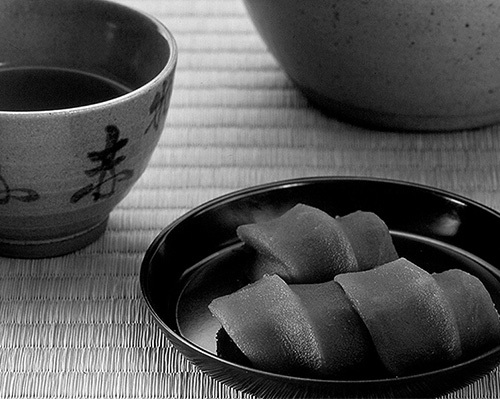 In 1911, the Empress wanted to try the famous rice cakes after hearing of Akafuku’s reputation from Emperor Meiji. Up to that time, brown sugar had been used as a sweetener, but the concern arose that the Empress might not like the taste of brown sugar, so, fine-quality white sugar was used for the first time. This was a great honour for Akafuku because, after that, the company repeatedly shipped sweets to the Empress at her request. As a result, Tanesuke established May 19, as "Homare-Bi (Day of Honor)," commemorating the day Akafuku first sent rice cakes to the Empress. At the same time, he publicly launched "Homareno Akafuku" rice cakes, using white sugar as a sweetener. This is the present "Akafuku Rice Cake". In 1954, Akafuku was registered as a limited liability company with capital stock of 5 million yen. Akafuku Co. Ltd., in its new endeavour (mainly by Mrs. Masu, wife of Tanezo Hamada, the eighth successor), began purchasing more than 20 manufacturers of similar products and, in turn, registered its trademark to prevent them from remerging.This is why we call Mrs Masu, the "Mother of the Restoration of Akafuku". Some years before, in 1937, their son, Hiroyasu Hamada, the ninth successor, was sent to fight in the Japan-China war and was killed on the battlefield in the year 1938. Masutane, Hiroyasu’s son, has been a great innovator for the company. In 1963, he established the branch outside Mie Prefecture. He then began supplying products to railway companies to be sold at station kiosks of Uehonmachi station of the Kintetsu line and at Nagoya station. The following year, he established the commercial office in the city of Osaka.Two years later he established a commercial office in the city of Nagoya and expanded the sales area in the stations of the Kintetsu line and in the department stores of the cities of Osaka and Nagoya. In 1976, he began placing a multicoloured card within each box, with a wood engraving and poems of each season printed on each side.This card with the date of production and sale was a message sent to customers from the President. The message changes every day. In 1977, the construction of the Ise factory was completed. In 1978, Akafuku began selling the monthly rice cake, designated "Tsuitachi Mochi (Rice Cake of the first day of the month)". In 1985, the "Isuzu Teahouse" was inaugurated, which offered customers sweets representing the seasons. 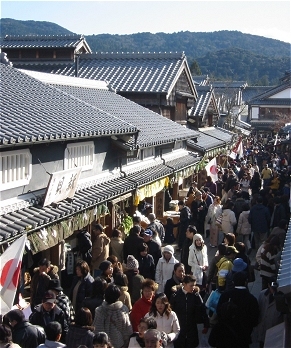 In 1993, he inaugurated the shopping centre of "Okage Yokocho (Okage : grateful or thanks)". There are presently 42 shops including shops of traditional craftsmanship, popular confectionary and traditional restaurants in an extensive area which occupies almost approximately 9000m². In the shopping centre project, the company risked its destiny, making an investment amounting to that of its annual sales, to rebuilt and rejuvenate the shopping centre in front of the entrance of the Ise Shrine, the birth place of Akafuku. Local companies have long wanted to see this shopping centre, which had completely lost its vitality, restored to its old glory. 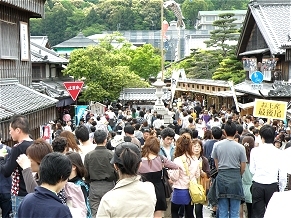 Thanks to the success of "Okage Yokocho", the shopping centre presently welcome more than 4 millions tourists annually. 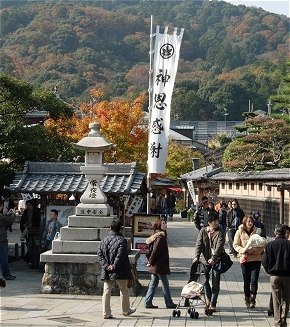 In 2007, AKAFUKU had the 300th anniversary of the founding. All staff of AKAFUKU was sent to Santiago de Compostella, in Spain, for the purpose of learning the welcome style for customers and sightseeing the city. In 2011, AKAFUKU acquired certification of ISO22000. The 62nd Removal of the ISE Shrine "Shikinen Sengû"
ISE Shrine has the 62nd Removal of the main Shrine (past 1300 years for the every 20 years).